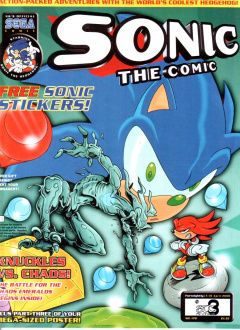 Sonic the Comic #178 is the one-hundred and seventy-eighth issue of the Sonic the Comic series by Fleetway Editions Ltd.
On the Floating Island, Knuckles is confronting Chaos who has come for the Chaos Emeralds, claiming they belong to him by right. Porker warns Knuckles that the creature was more powerful than the Freedom Fighters could handle even before he had the Chaos Emeralds. Outside the island, Tails and Amy are approaching the island in the Tornado, subconsciously knowing something is very wrong. Knuckles realises there is only one way to stop Chaos now, and it's to eject the Chaos Emeralds, but he is very hesitant to do so as this would doom the island. After some encouragement from Porker, he manages to do it, and Chaos' howl of rage can be heard from outside the island. Meanwhile in the dark dimension, Grimer sees the Emeralds being ejected and Chaos' pursuit of them. This seems to spark something in Robotnik's mind, and after a change of clothes he starts moving out of his hole at long last, with a gleeful Grimer in tow. Back on the Floating Island, Tails and Amy arrive too late, as Knuckles is undergoing some sort of an emotional crisis having failed his life's work. Without the Emeralds, the island is about to fall, and Knuckles has nothing left in life anymore, and thus urges the remaining Freedom Fighters to leave, with no intention of leaving himself. He only accompanies them after Amy gives him a little persuasion with an iron bar, and the heroes only just manage to escape in the Tornado before the island sinks below the ocean's surface. After landing, the Freedom Fighters muse upon what might happen when Chaos manages to track the Emeralds down, but are interrupted by an unseen voice vowing that they will think of something, because they always do. The gang swivel around to see none other than Sonic standing before them, vowing that this time he is back for good. Speedlines: Sonic answers questions from readers regarding praise for Tails, a future Sonic and Knuckles team-up, fan characters, a "Sonic gamg" and a possible review of Sonic Adventure (this review would never appear). Graphic Zone: Fan art submitted by readers. The theme for this issue's Graphic Zone is "Sonic and the Gang", featuring pictures of Sonic's friends. Owners of the printed art each won a Sonic the Hedgehog digital watch. Two of the entries in this issue's Graphic Zone did not provide the artists' names or addresses. The third part of a mega-sized Sonic poster. This page was last edited on 19 March 2019, at 14:44.